Have you ever tried going vegan for a week or even for a day just to save money or see what it’s like? I have. It wasn’t always a fun experience. I’d eat something and then find myself in the kitchen again really quick. And I don’t think I’m alone in this. So that’s why I made a list of awesome vegan dishes that’ll also fill you up! I had to start off with one of my favorite food blogger’s recipes. These detox rainbow roll-ups are what delicious dreams are made of. Colorful, savory, crunchy… it’s kinda hard to go wrong here (for real). And whether you eat them as is or smother them in tasty peanut sauce, it doesn’t matter. You’re in for a real treat! This recipe is so simple and packed with vitamins and antioxidants. Share this with your friends or family, for a healthy, satisfying meal. Suddenly cauliflower is the new “it” veggie popping up on menus everywhere. Added flavors like turmeric, curry powder, and coconut milk complement quinoa nicely, this Indian-inspired dish is a total win! Looking for an on the go meal? Consider this wrap, stuffed with your favorite vegetables, beans, and creamy hummus. It can actually fill you up for your next activity. You’ll love the combination of olive oil, artichoke heart, and cannellini beans in a yummy tart. And it just takes a few minutes to prepare. Feel free to play with your colorful raw veggies as much as you like for because this dish requires no recipe. Anything goes well and it’s super quick to put together and it can be served as a main dish or side. Try this yummy sandwich, a classic comfort food that will go perfectly with any weather. Looks delicious, doesn’t it? This burger will surely be a hit even with the craziest veggie haters. Cherry tomatoes, zucchini, mushrooms, and corn… threaded together then glazed with peanut butter cilantro marinade and grilled. Doesn’t that sound lovely? This takes kebabs to a whole new level. What I love about this meal, it’s not all mayo-ed out like potato or pasta salad. So refreshing and easy to make. Perfect for Sunday a potluck lunch. These rolls are light, fresh, healthy, crunchy and loaded with vegetables and herbs. It’s absolutely a good meal for lunch or snacks. 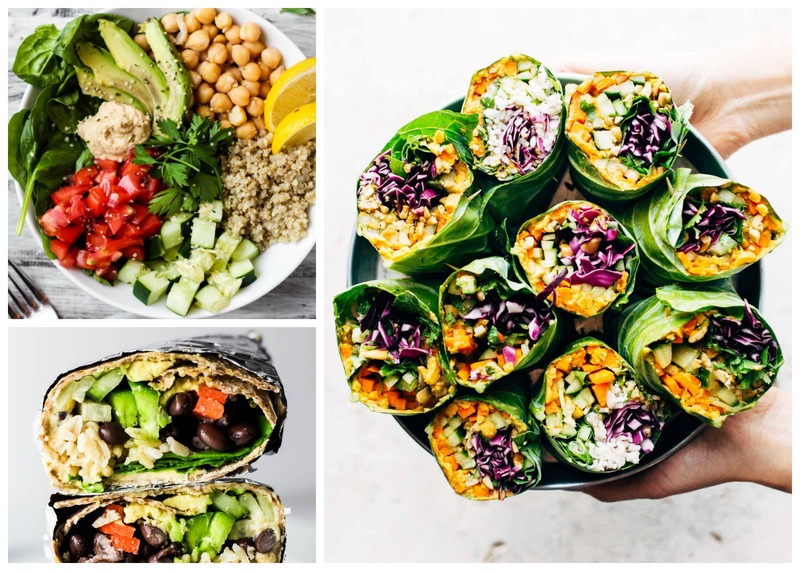 Whether you’re inspired to try eating vegan or you just want to test out the waters, these awesome recipes will totally fill you up. They are so easy to prepare and very nutritious, a good meal to include in our diet. So what are your favorite vegan recipes? Try these out and let me know what you think.